I love buying new spring apparel as the weather gets warmer every year. However, I have to keep myself on a very tight budget which means I usually am only able to get handful of new items a year. This year, though, I have found out where to find beautiful spring apparel on a budget and the place may surprise you! Dollar General, yep, Dollar General. We’re talking about gorgeous dresses (how beautiful is the dress above for just $12?! ), tank tops, shorts, capri pants, swim wear and more for under $15! You can even buy flipflops for $1 each so you can actually afford to get multiple colors. As you can see from this picture, there’s a lot of various items for the whole family. 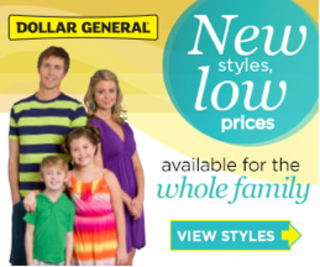 Dollar General has you covered with great outfits for the days at the beach or pool, days playing and working outside, to all those casual cookouts and get togethers. Plus with hats at $4, sunglasses as low as $4 and more, you can easily accessorize and spend under $25 for your whole look – how awesome is that? I know I usually spend at least that much on just a nice looking top or pair of shorts! Be sure to like Dollar General on Facebook and follow Dollar General on Twitter to keep up with the latest fashions at amazing prices. Check out the Dollar General Apparel Book to see where to find beautiful spring apparel on a budget! Do you see any outfits you’re going to put together? « Do Faucet Spots Drive You Crazy?